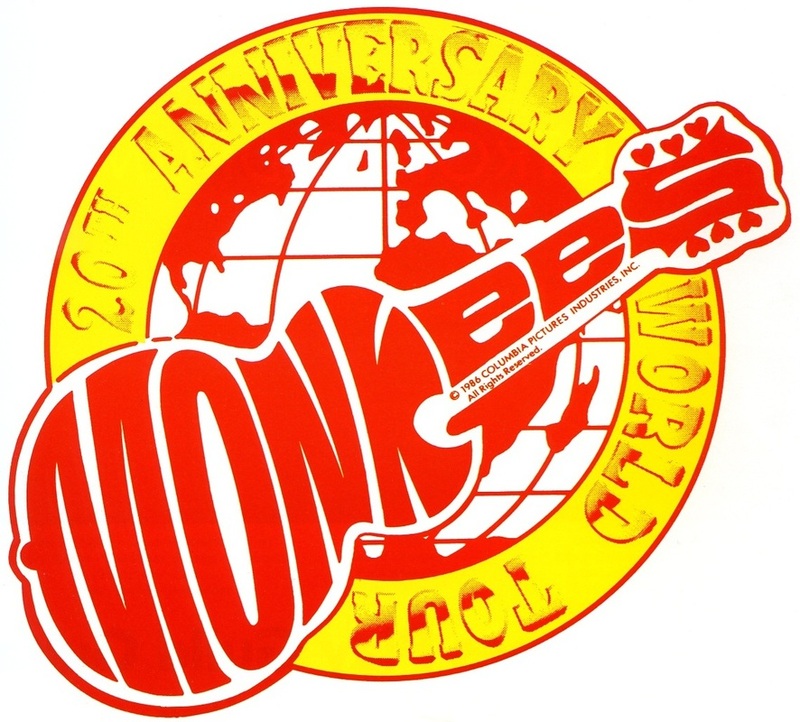 ​"Critics of the band wouldn't believe it - and they certainly wouldn't have been there to witness it themselves - but The Monkees are a legitimate rock and roll band. 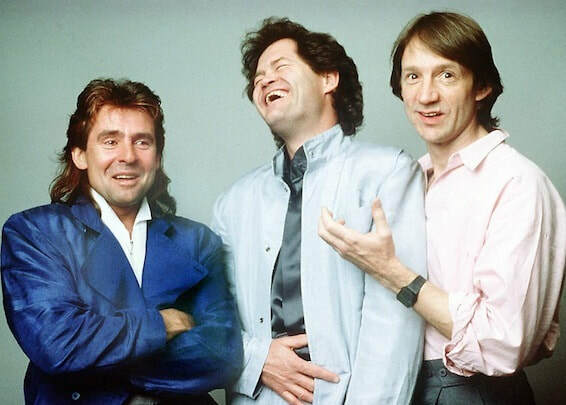 They're also entertaining, something that can't be said about some of their '80s counterparts . 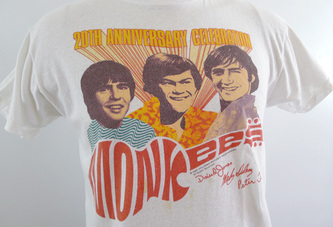 . .
​The Monkees are a hard act to follow." ​"Unlike many revived 60's acts that robotically churn out old hits, the three Monkees exhibited genuine affection and care toward their music and an unpretentious attitude in their performance. 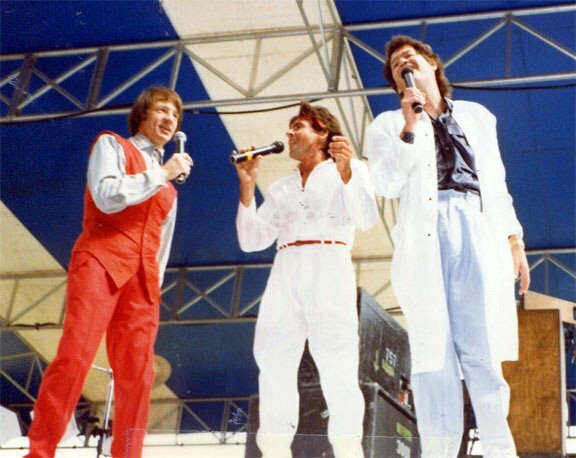 And playing to a crowd of more than 11,000 screaming fans that spanned two generations undoubtedly boosted the exuberance level of the band members." 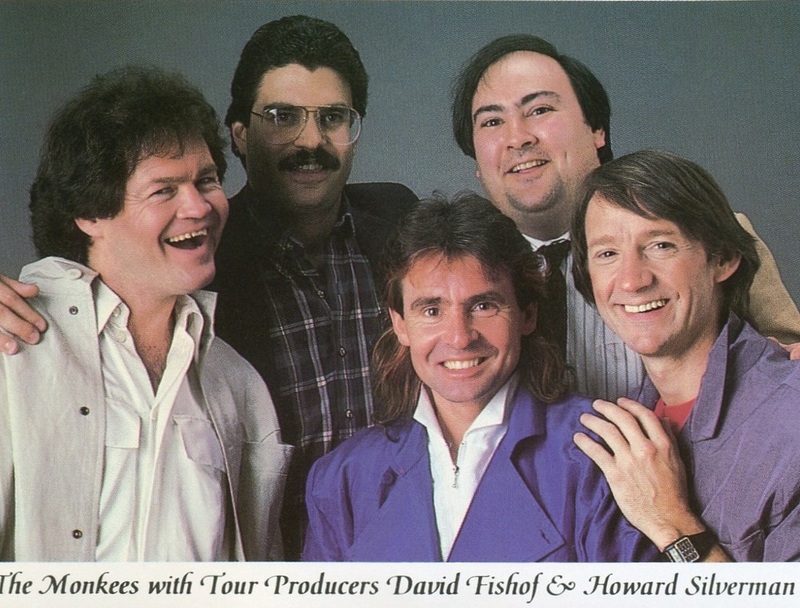 Also performed but dropped were "Take a Giant Step,"
​"Star Collector" and "Sometime in the Morning"
In 1985 music promoter David Fishof had been promoting the Happy Together shows, a series of Sixties-revival package tours. 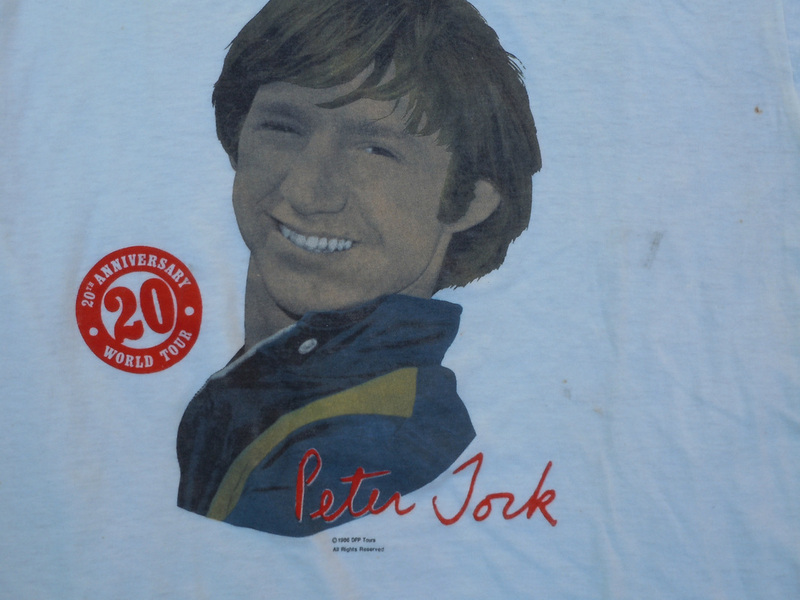 He eventually approached Peter Tork in Manhattan about the idea of a Monkees reunion to celebrate the group's upcoming 20th anniversary. Tork initially turned him down, but agreed to attend one of the Happy Together concerts from backstage before making a final decision. 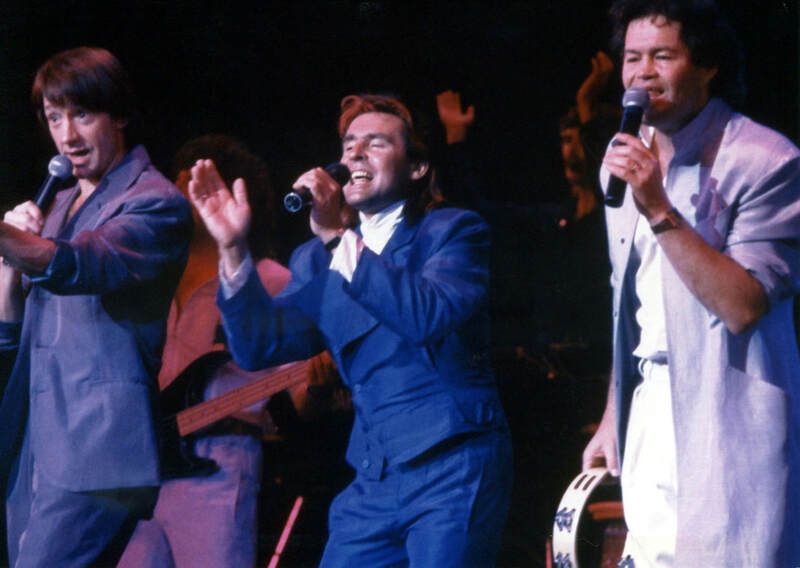 Peter came away impressed and agreed to travel to England with Fishof to broach the idea with both Micky Dolenz and Davy Jones. 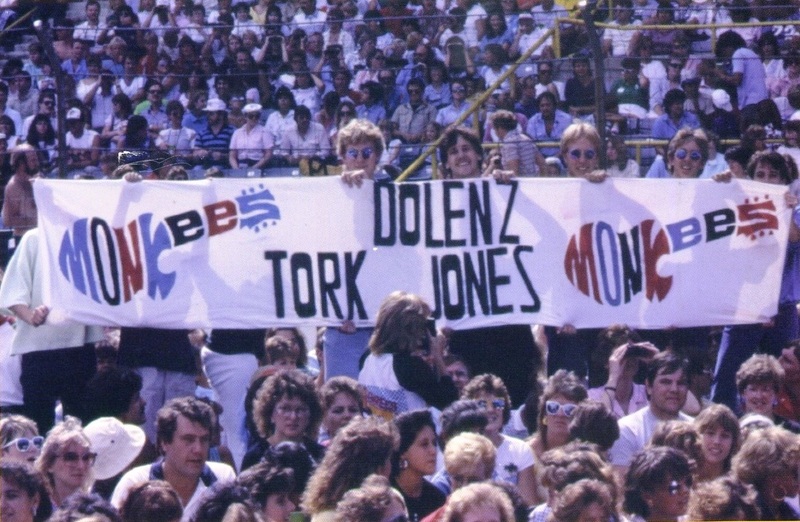 Having encountered success as a TV and video director in England, Dolenz was very reluctant and unsure if there would be any interest in seeing The Monkees in concert again. 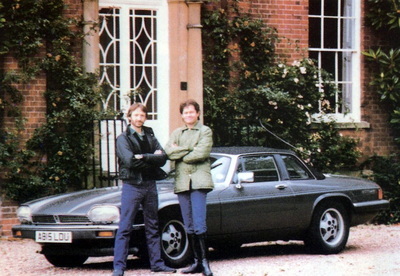 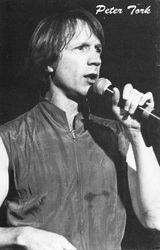 Fishof and Tork found Jones tending his horses and starring in a production of Godspell in London at the time. 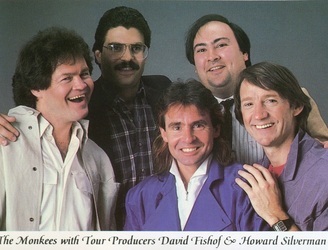 But Fishof persisted. After multiple transatlantic trips, Micky and Davy agreed to join the reunion. 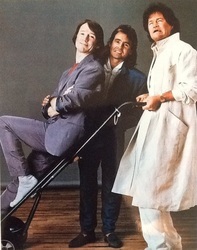 The final piece of the reunion puzzle was Michael Nesmith. 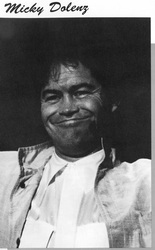 By the 1980s, he was the owner of the Pacific Arts Corporation, which developed various media projects and produced motion pictures. 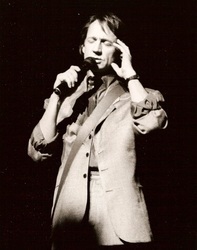 Despite his bustling workload, Nesmith was, in fact, originally going to participate in the tour. 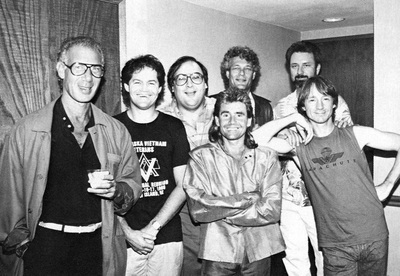 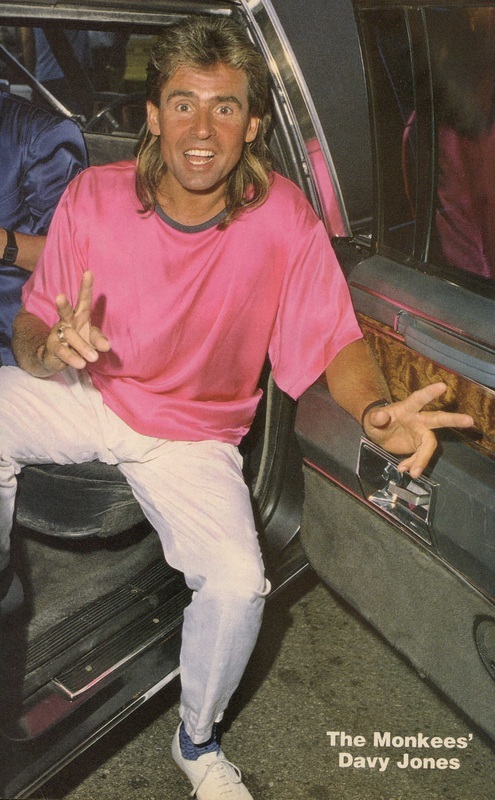 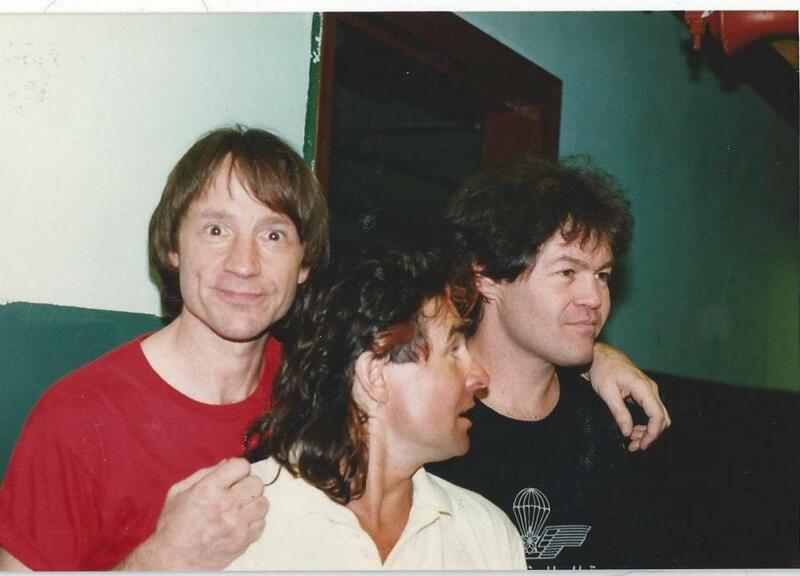 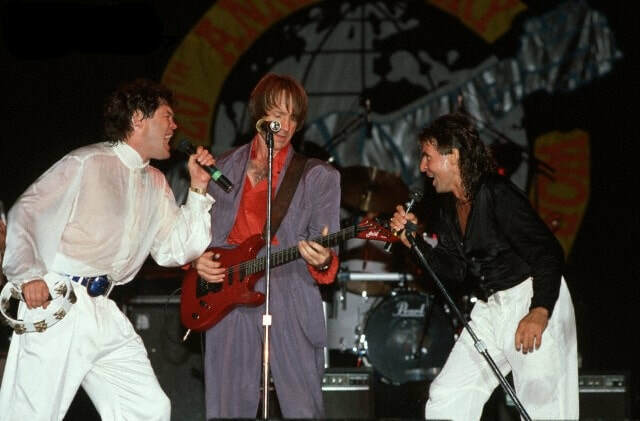 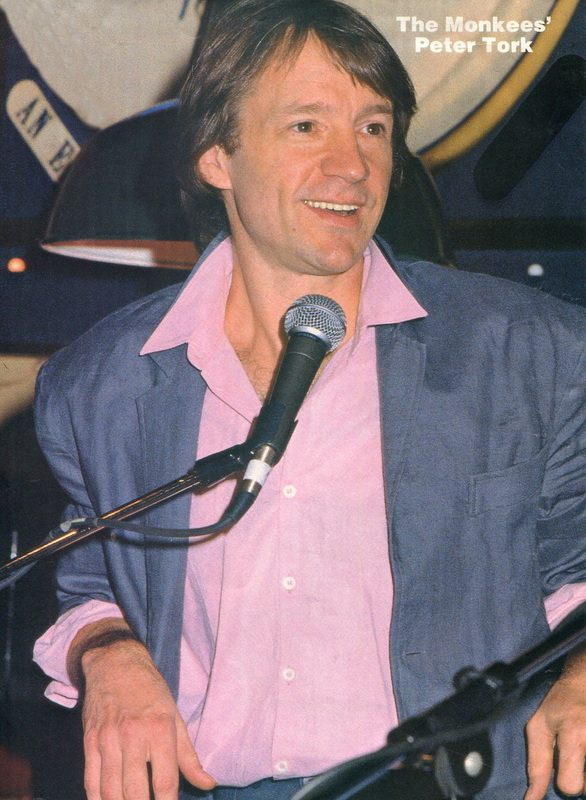 "When the whole thing [the Monkees reunion] first started off, there were 10 or 12 dates and I was on them and looking forward to it," Michael told Goldmine magazine in 1991. 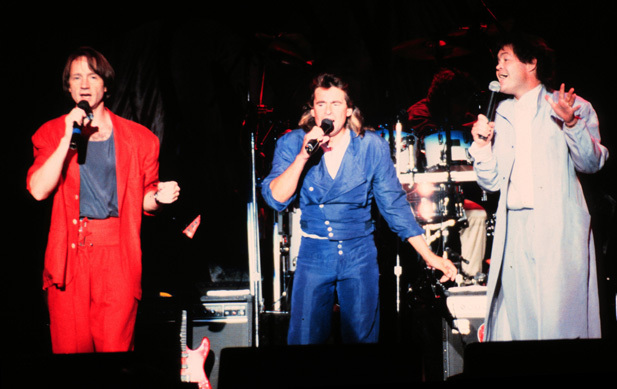 "Well, because it was the 20th Anniversary and nobody knew it was going to get as big as it did, it went from 20 dates to 200 in just a matter of weeks." 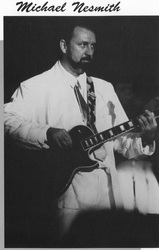 Because Nesmith was producing the film Square Dance at the time, he was ultimately forced to withdraw from the reunion. "I'd planned on being able to tuck and roll the movie in between the [Monkees] dates but the next thing I know it had gone from going out for a few weekends to going out for four months solid. So, the time constraints just conspired against me." 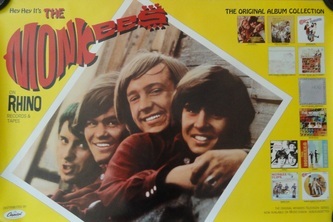 Nesmith instead voiced his support for the rest of the group as well as his desire to play with The Monkees when the moment allowed. 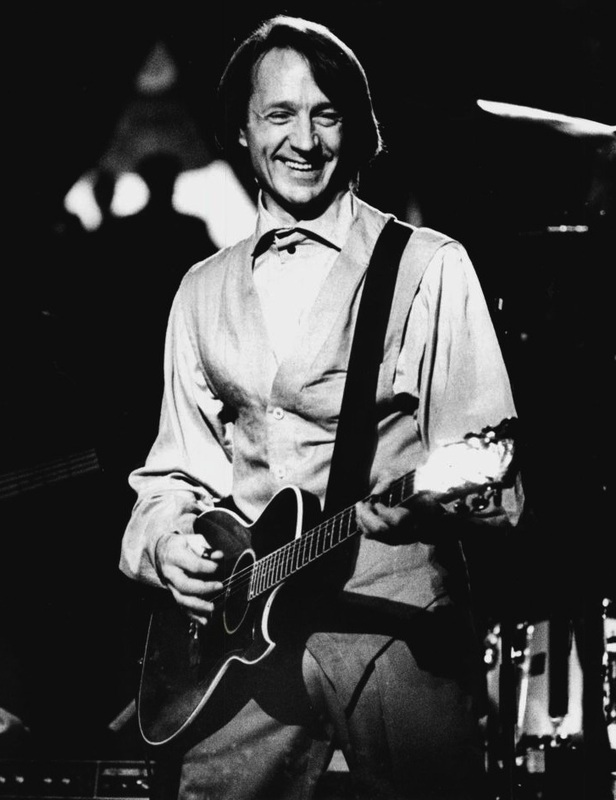 "Then, for some reason," he said, "the perception got out that, well, he never did like this whole thing, and the fact of the matter is that Nesmith does just fine with it. 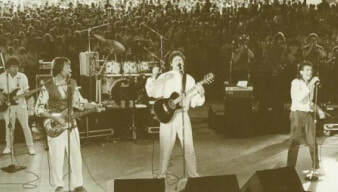 I like it a lot, it's perfectly fine," Michael told Goldmine. Before the tour got underway, Micky took a moment to reassure fans about Michael's support for the trio's new activities, telling the Philadelphia Daily News that "He's behind us all the way." 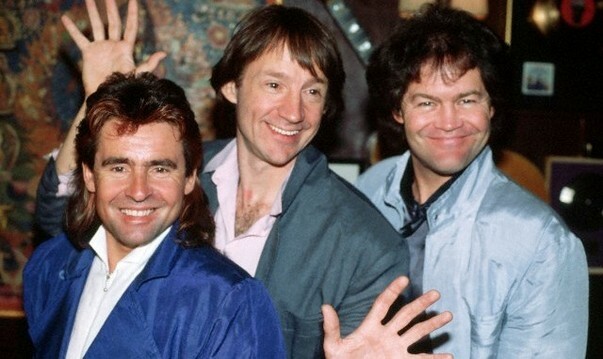 With the reunion now finalized, David Fishof was at first unsure how to promote a Monkees reunion tour and even less certain of how it would be received. 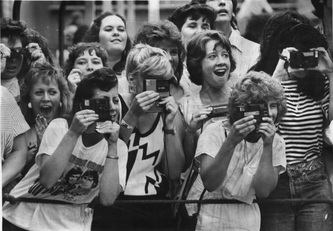 But an event in early 1986 changed everything. 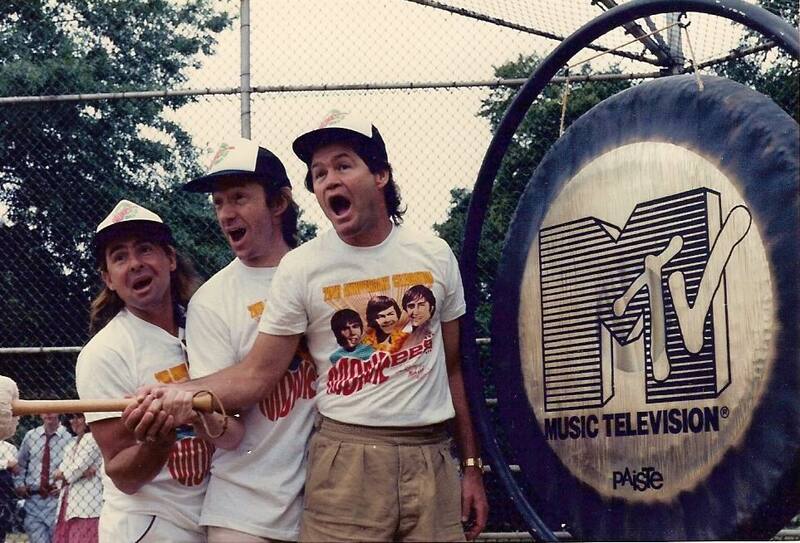 On February 23, 1986 MTV aired a weekend marathon of The Monkees television series. The reaction was overwhelming and birthed what would become a major resurgence for The Monkees just as the band was set to reunite. 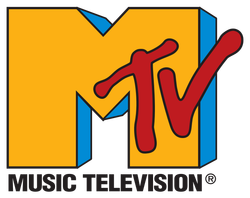 "We've never received such a volume of mail," MTV's general manager Tom Freston told Rolling Stone magazine in September 1986 about the initial response to the marathon airing of episodes. 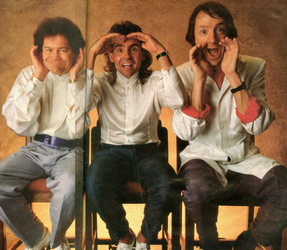 "We were dumbfounded by the whole thing." The perfect storm that was brewing around the reunion was completed just as the music of The Monkees was being made available again. 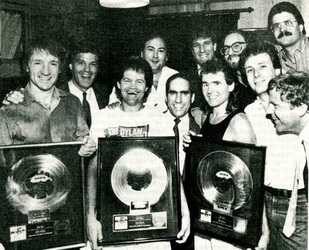 In 1985, Rhino Records licensed the rights to the band's original nine albums and immediately began a reissue program, even before MTV started to air the series. 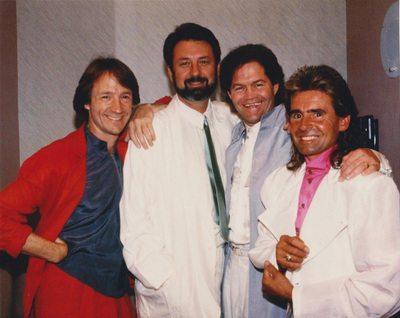 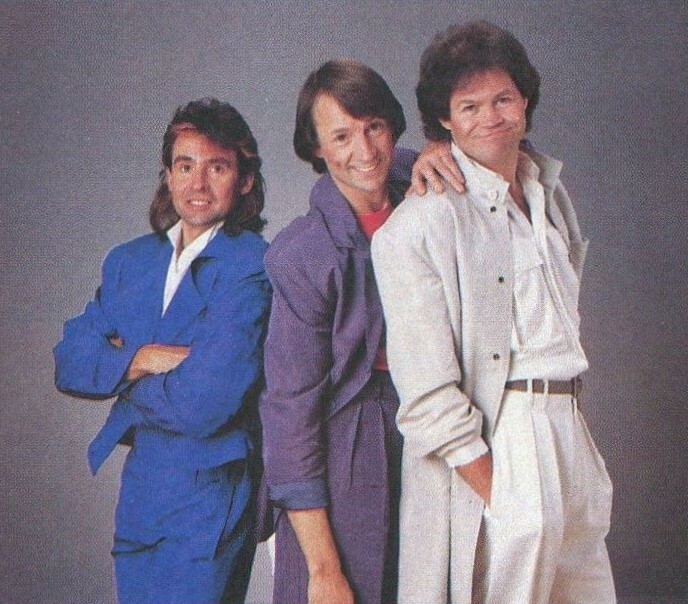 The Monkees’ 20th Anniversary Reunion Tour of 1986 became one of the biggest grossing tours of that year and the hottest ticket of the summer, having sold out nearly every date on the itinerary. 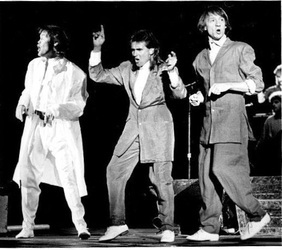 The tour was originally booked in small amphitheaters for a period of six weeks. 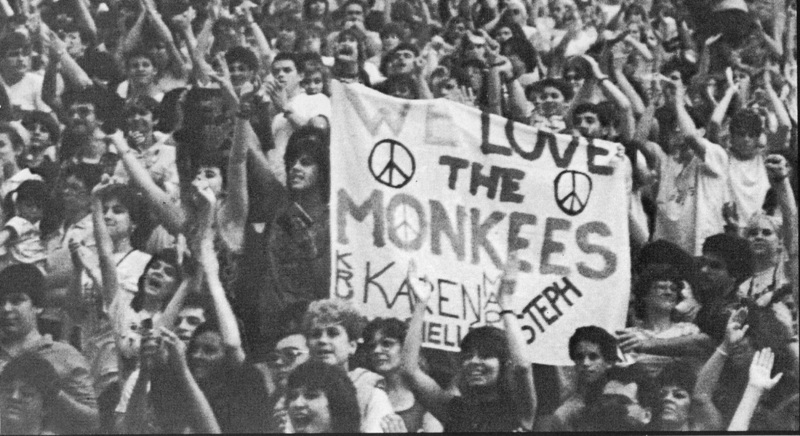 But after the heavy promotion by MTV, a new generation of Monkees fans was born and the demand for tickets increased dramatically. 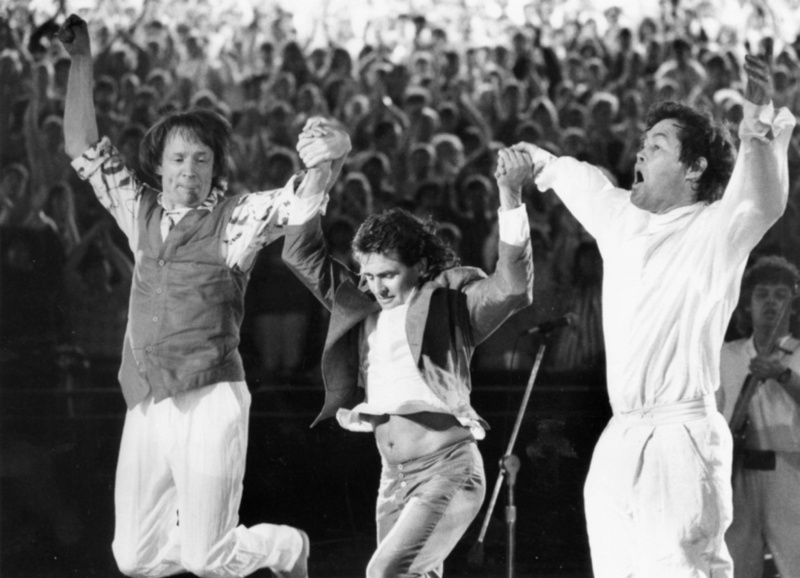 As a result, the tour quickly stormed into larger capacity arenas and stadiums, keeping the trio on the road for an incredible six months. 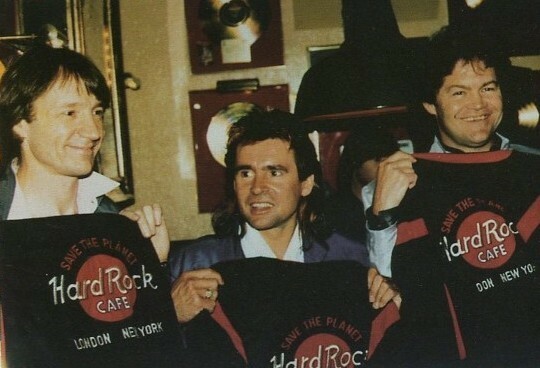 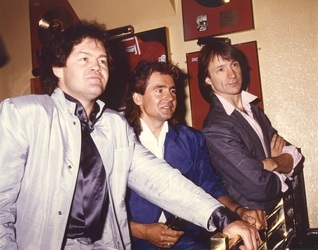 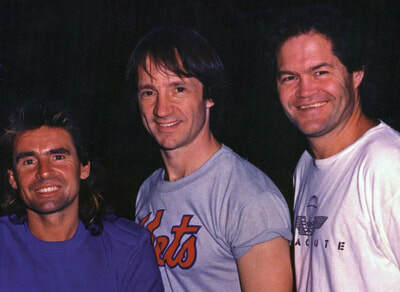 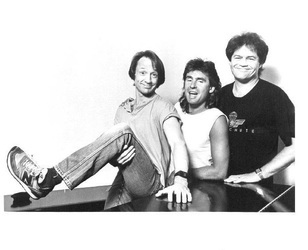 A press conference was held on May 28, 1986 at the Hard Rock Cafe in New York City to officially announce that The Monkees would embark on a 100-plus city tour. 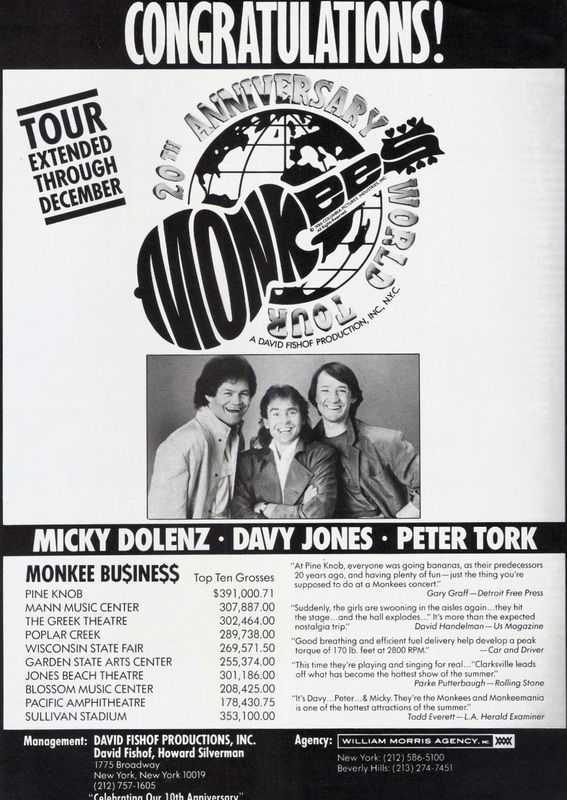 (Nesmith originally planned to be at this press conference with Dolenz, Jones and Tork to explain his absence from the tour, but scheduling conflicts prevented his attendance.) 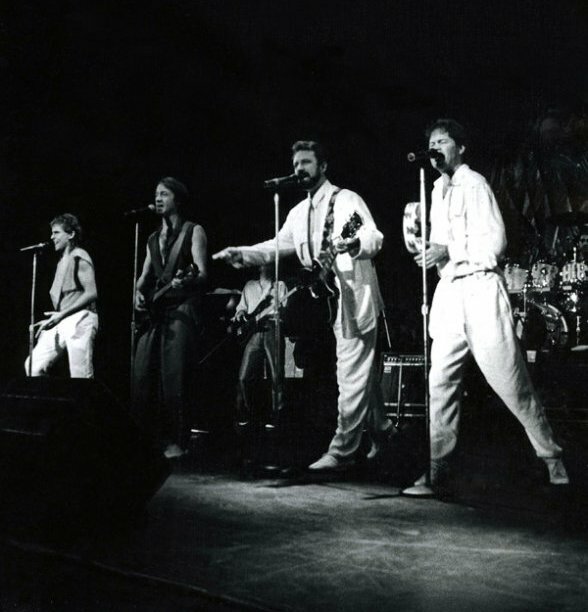 Two weeks of rehearsals were undertaken at a Catskill Mountains resort in New York before the tour officially kicked off on May 30, 1986 in Atlantic City, New Jersey. 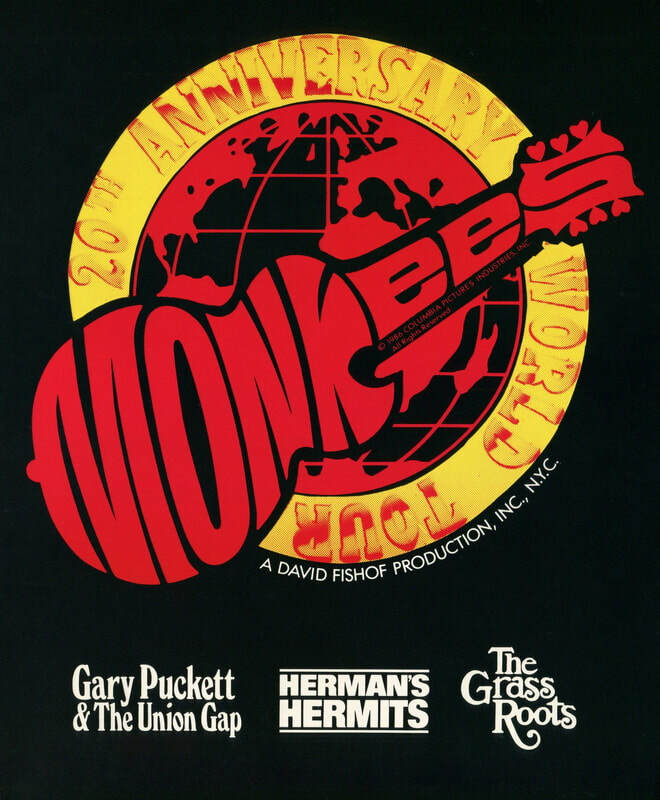 Herman’s Hermits, Gary Puckett and The Union Gap, and The Grass Roots were featured as opening acts on the tour. 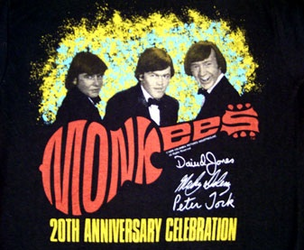 An eight-piece backing band, including a horn section, provided instrumental support for the three Monkees. 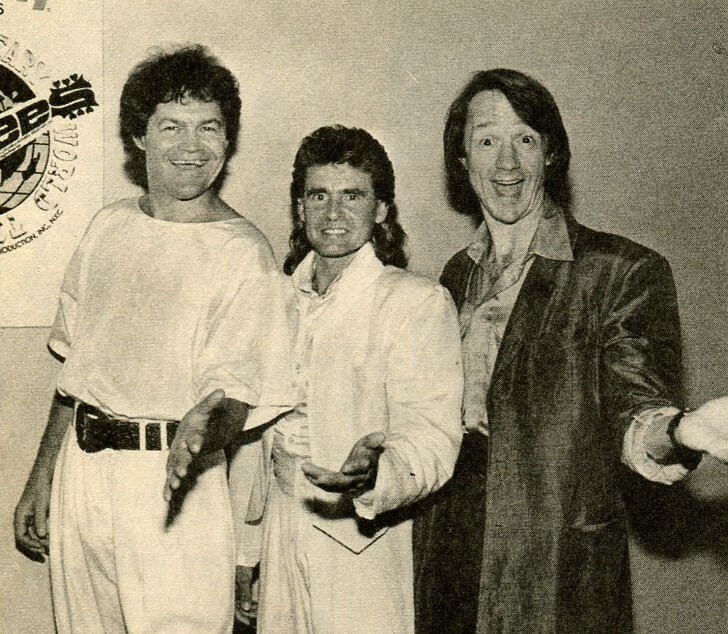 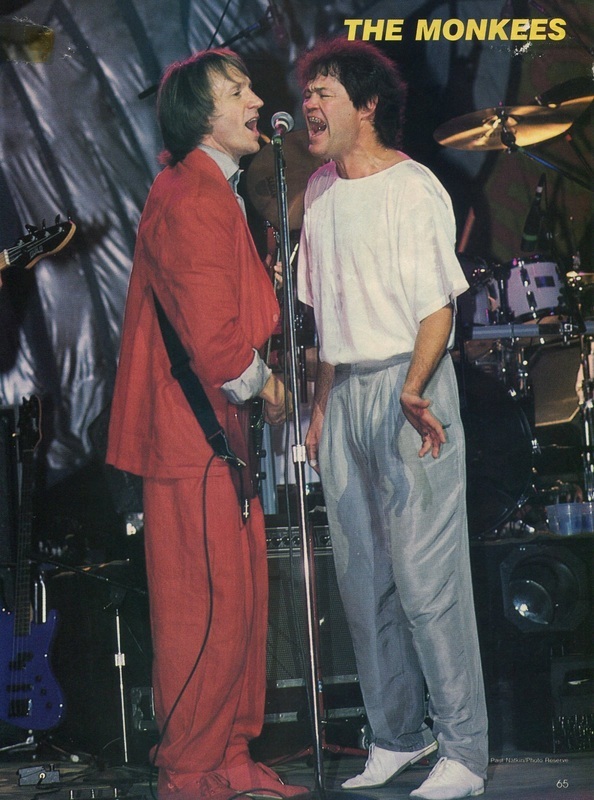 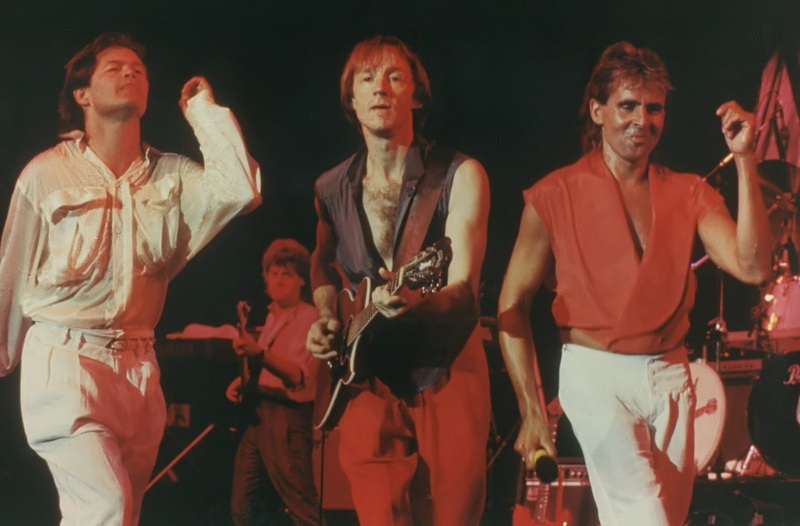 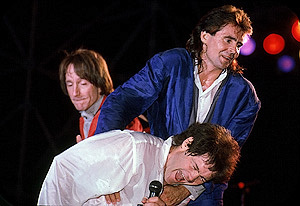 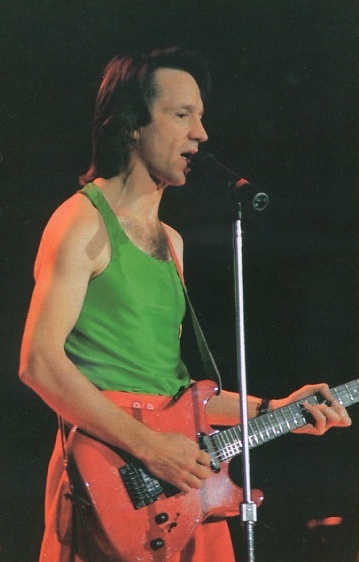 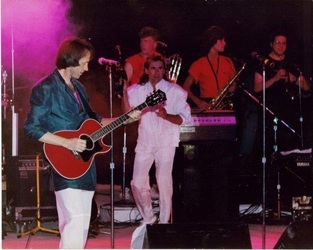 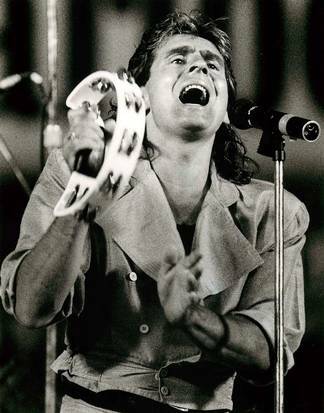 Peter played rhythm and lead guitar throughout the show, as well as the banjo on “Cripple Creek.” Micky occasionally used a stand-up electronic drum kit at the front of the stage, and Davy provided his usual percussion parts. 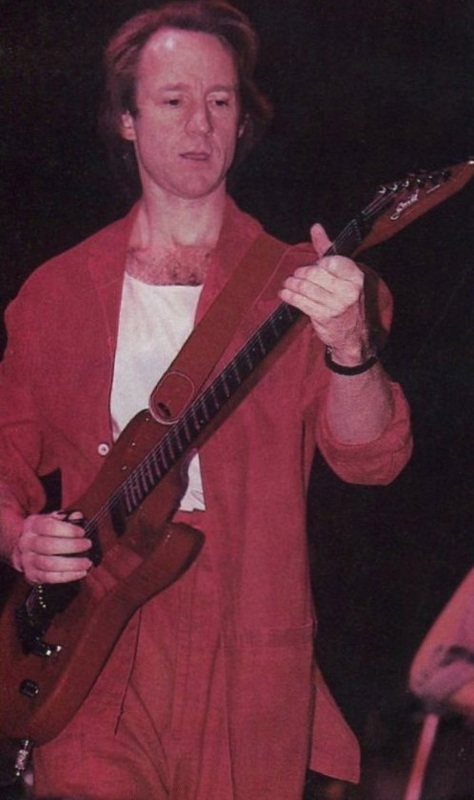 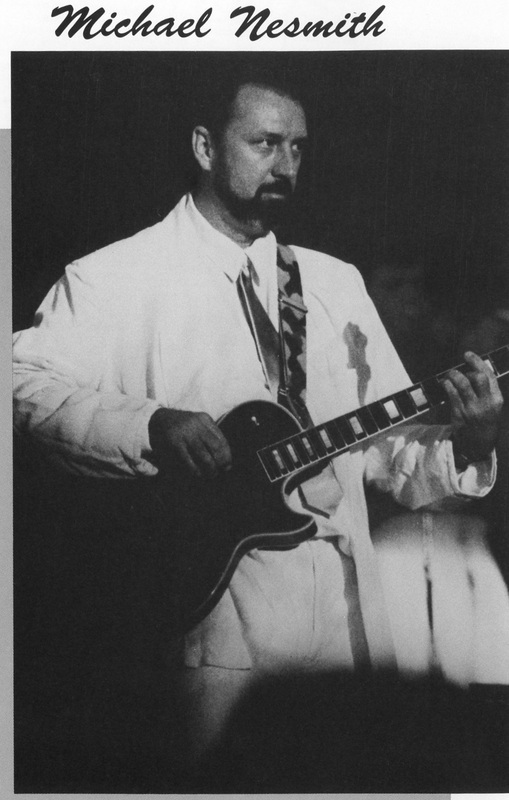 Micky also played guitar on “Pleasant Valley Sunday” at most of the shows. 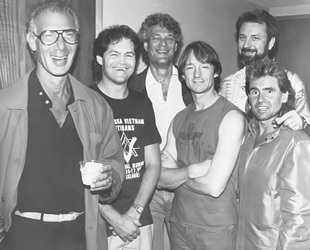 The backing band included Dusty Hanvey (guitar), Larry Nelson (keyboards), Mark Clarke (bass), Eddie Zyne (drums), Kevin Osborne (trombone), John Leslie (saxophone), Lon Seaman (trumpet), and Jim O'Connor (trumpet). 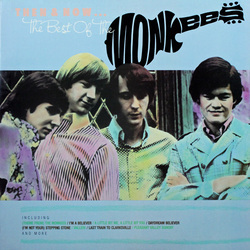 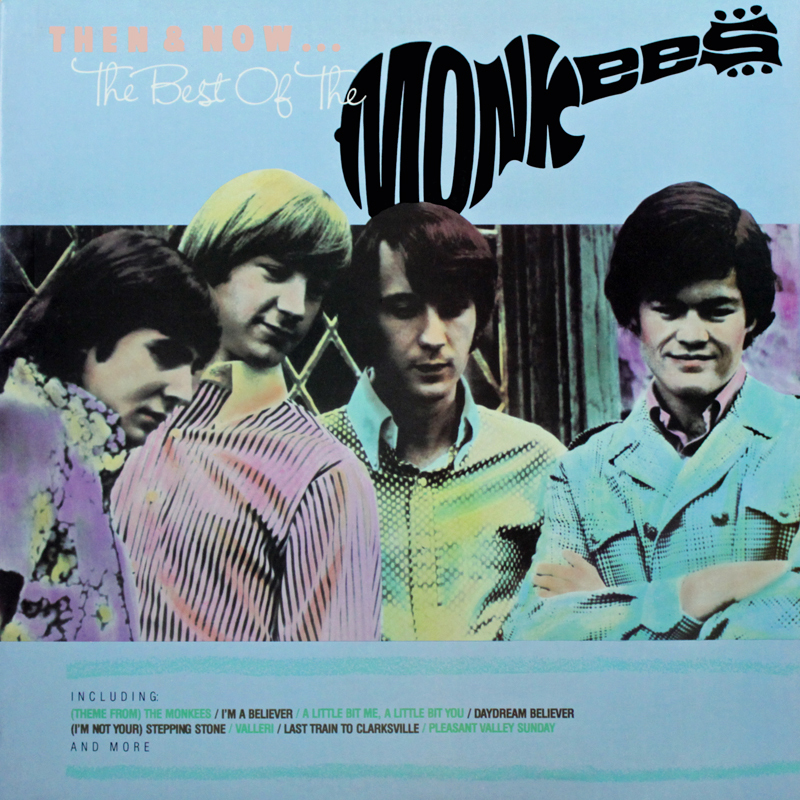 A compilation album with three newly recorded songs, Then & Now...the Best of The Monkees, was released by Arista and went platinum during the tour. 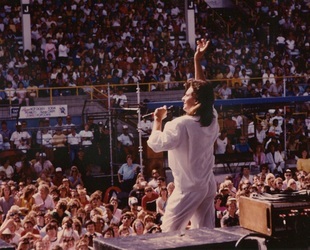 “That Was Then, This Is Now” became the band's new single and a video for it was filmed at the Great Arena in Jackson, New Jersey on July 25 (and can be seen below). The video received heavy airplay on MTV, making the song a Billboard Top 20 hit in the summer of 1986. (Another new track from the Then and Now album, "Anytime, Anyplace, Anywhere," co-written by original Monkees tunesmith Bobby Hart, can be heard below.) 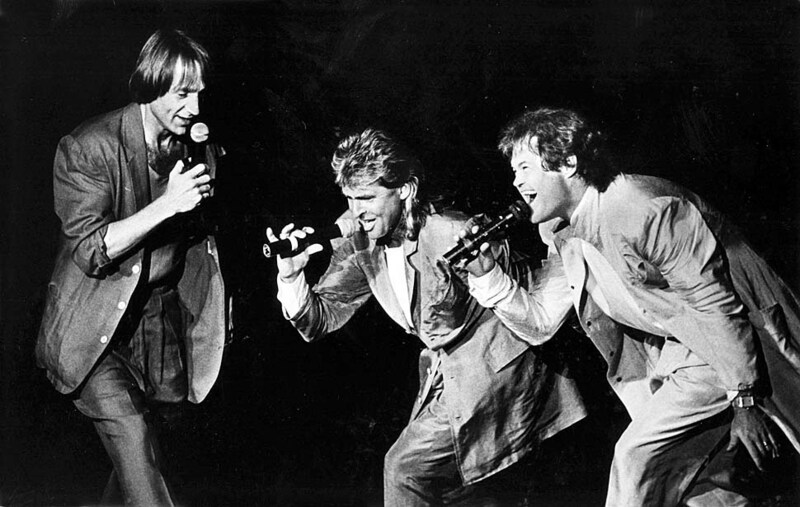 An original Tork composition, “MGBGT,” as well as Davy’s “I’ll Love You Forever,” rounded out the new material being played on the tour. 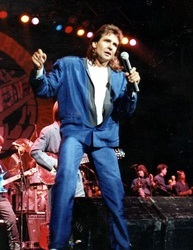 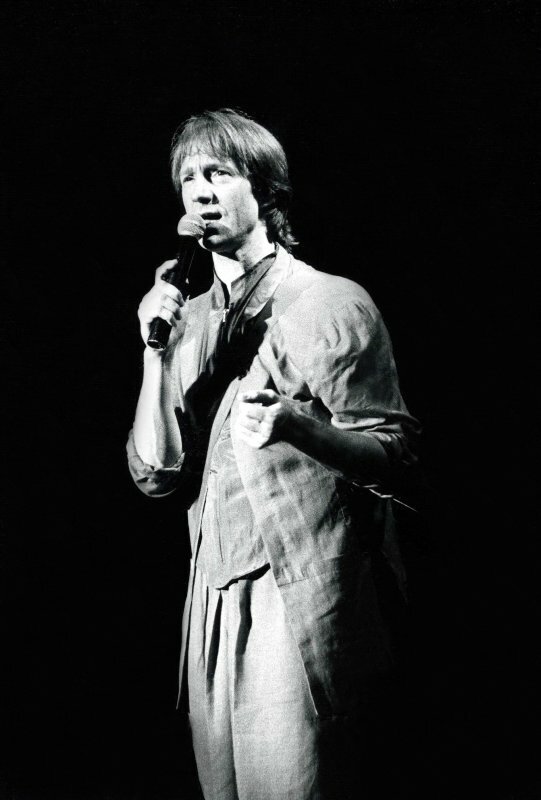 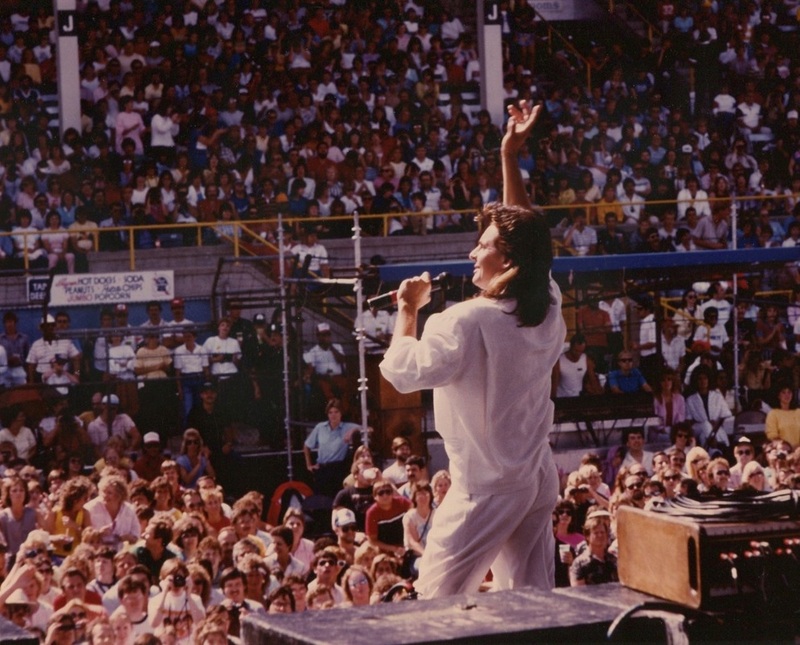 ​During some of the earliest shows, Peter performed “Peter Percival Patterson’s Pet Pig Porky” before “Pleasant Valley Sunday.” Peter, as he would do on all future tours, handled lead vocals on his self-penned “For Pete’s Sake,” unlike the album version of the song where Micky sings the lead vocal. 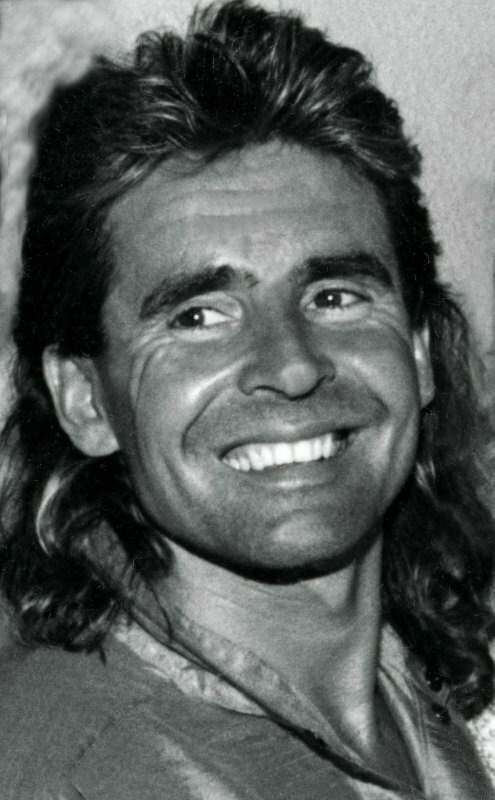 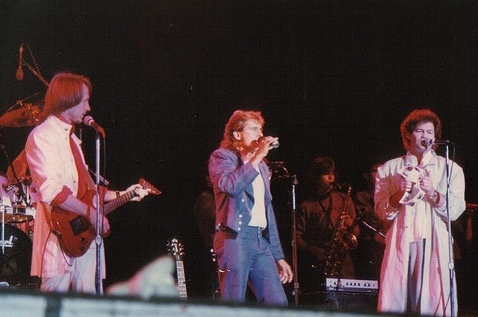 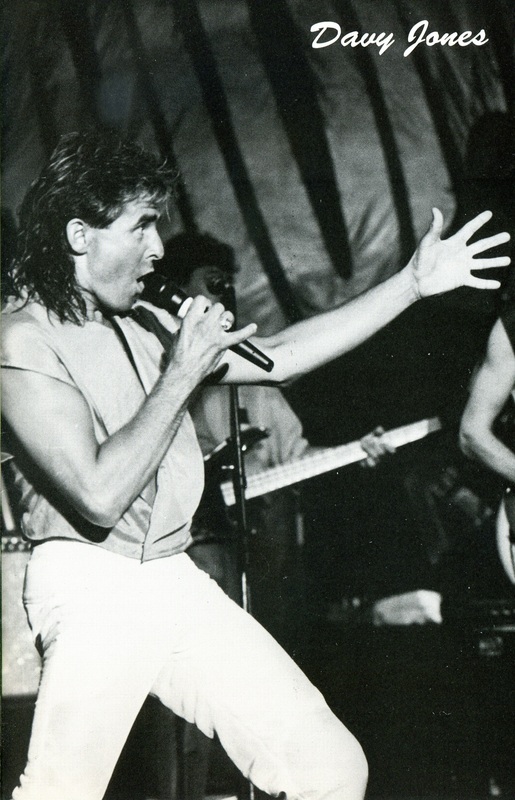 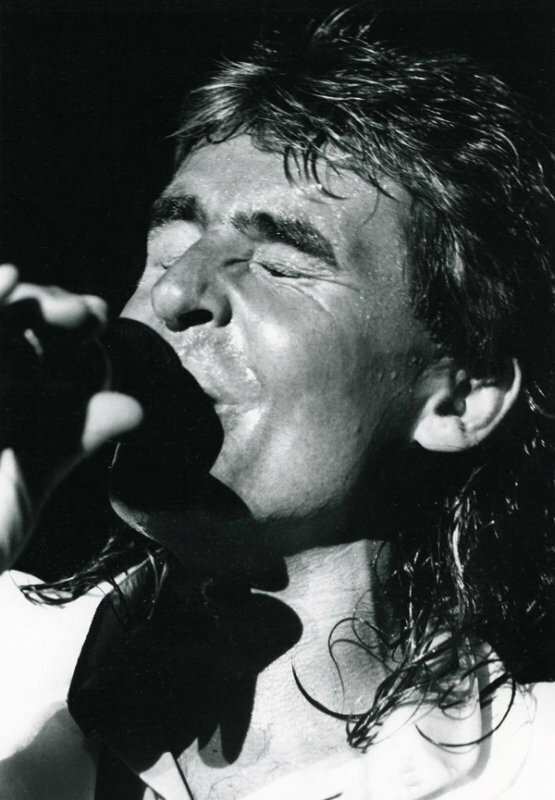 Peter also sang the complete lead on “Shades Of Gray,” slightly different from the album version featuring Davy sharing the lead vocal with Peter. "Listen To The Band" showcased all three members, an arrangement that would continue during future Monkees tours. 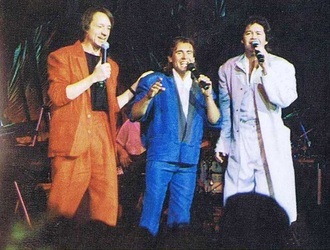 The members of the backing band would be introduced each night during the performance of "Listen to the Band." 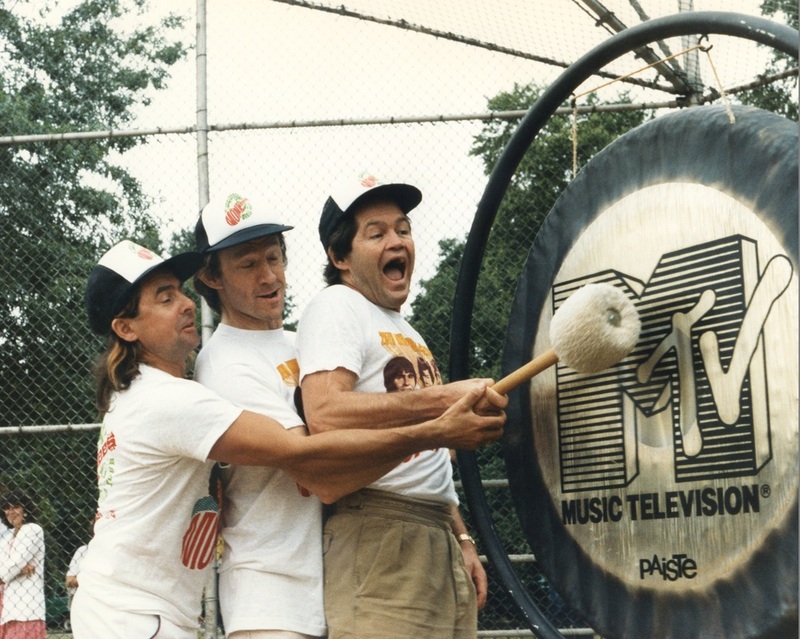 After the initial success of the "Pleasant Valley Sunday" marathon of The Monkees television series on February 23, MTV started to air the series twice a day, seven days a week. 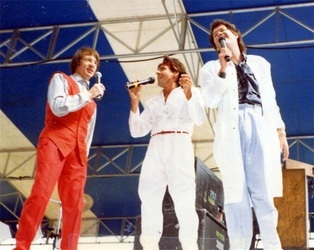 By April, the show was being screened three times a day. 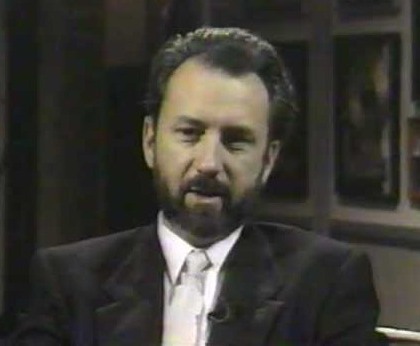 Micky and Peter acted as guest VJs on MTV in early May, and another marathon of episodes occurred in June. 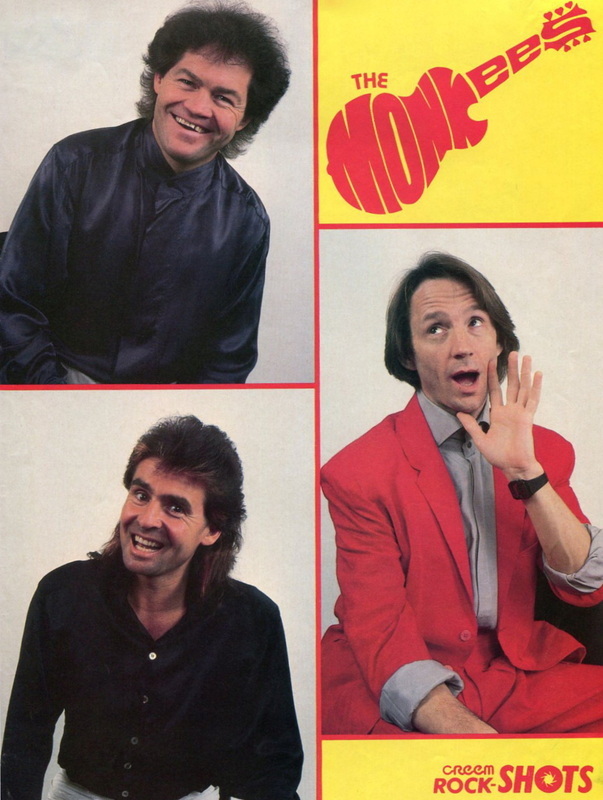 During the summer of 1986, 87 television stations around the United States were syndicating The Monkees. 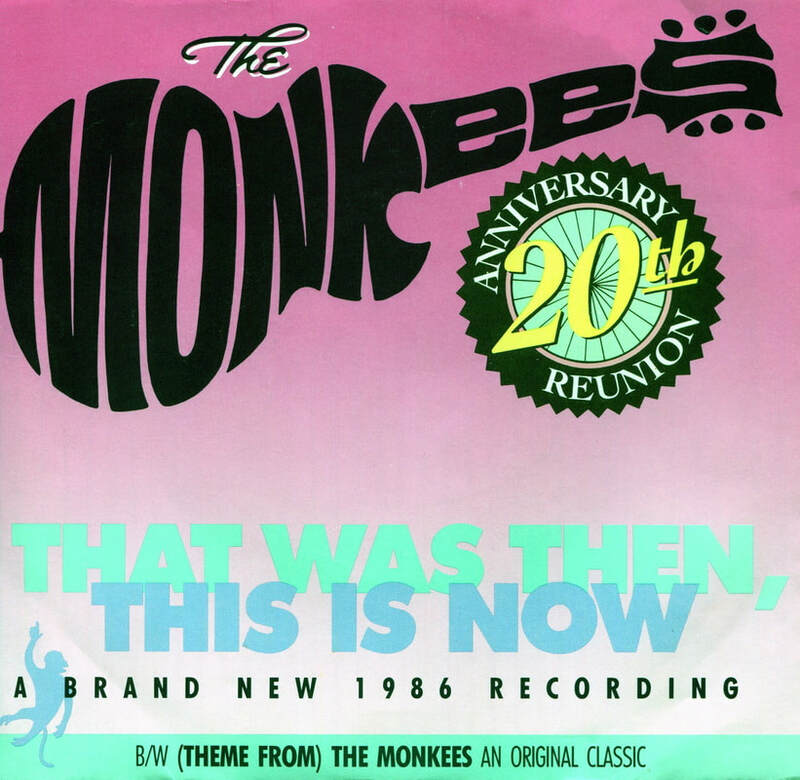 By the time the video for "That Was Then, This Is Now" debuted on MTV in early August, Monkeemania was in full swing again. 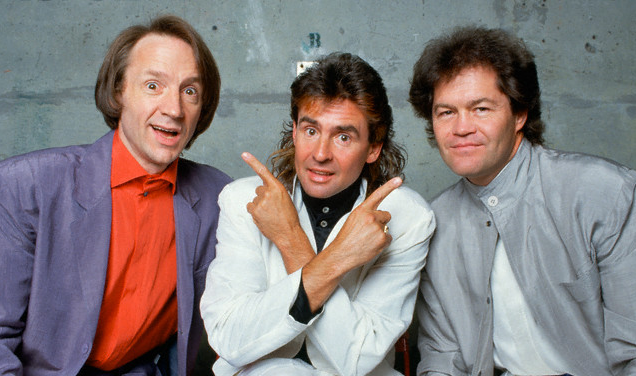 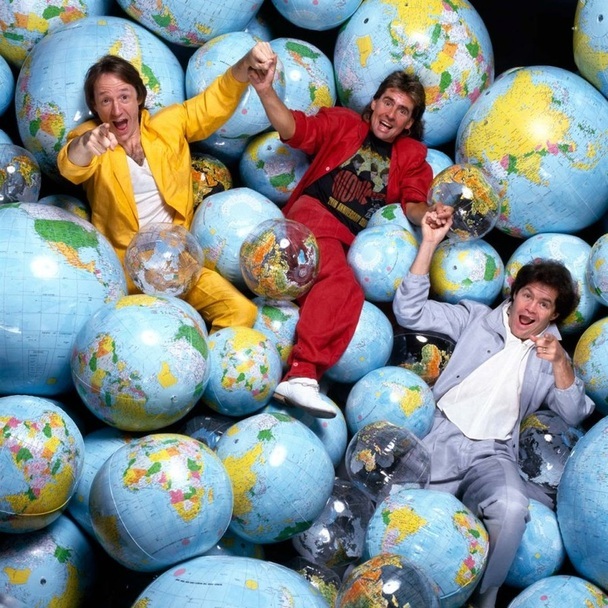 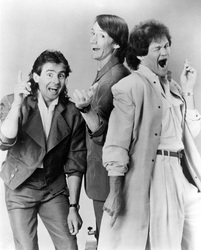 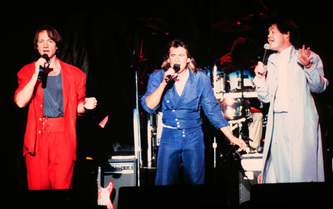 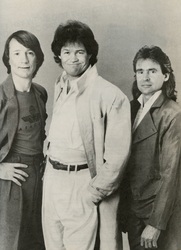 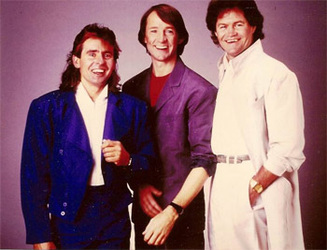 The trio later performed at the 1986 MTV Video Music Awards with their backing band (seen below). 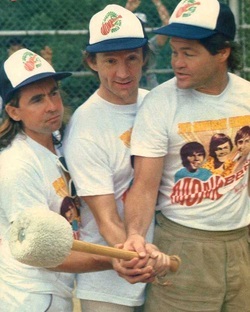 With the tour still adding dates in the fall, MTV brought in Micky, Davy, and Peter to host another extended airing of episodes in October. 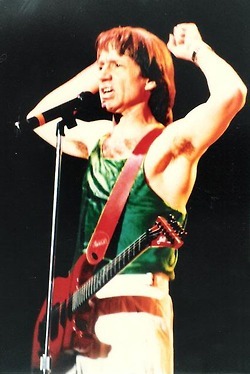 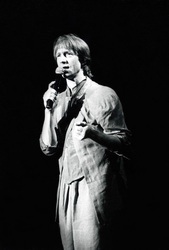 Peter often referenced the MTV phenomenon while on stage. 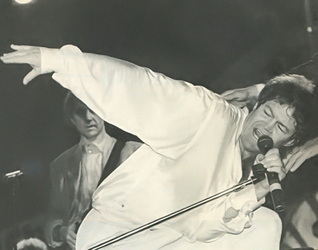 "Those of you who know a little bit about the history of our group," he would say to a thunderous reaction from the crowd, "Well, that tells me one of two things - your age or your cable viewing habits!" The presence of The Monkees on MTV, the success of the new single and the popularity of the tour resulted in seven of the nine original Monkees albums returning to the Billboard Top 200 chart, along with the Then and Now collection. 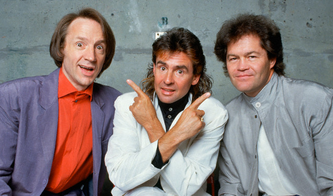 By the end of 1986, Rhino Records had sold over 2 million albums in The Monkees' back catalog. 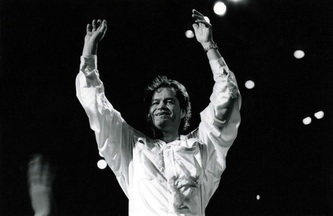 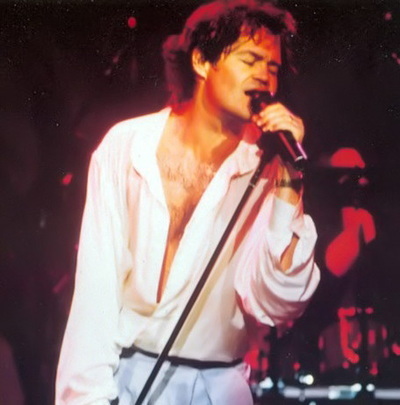 "We weren't prepared for this," Dolenz said in a 1986 interview. "Suddenly we found ourselves one of the hottest acts of the summer." 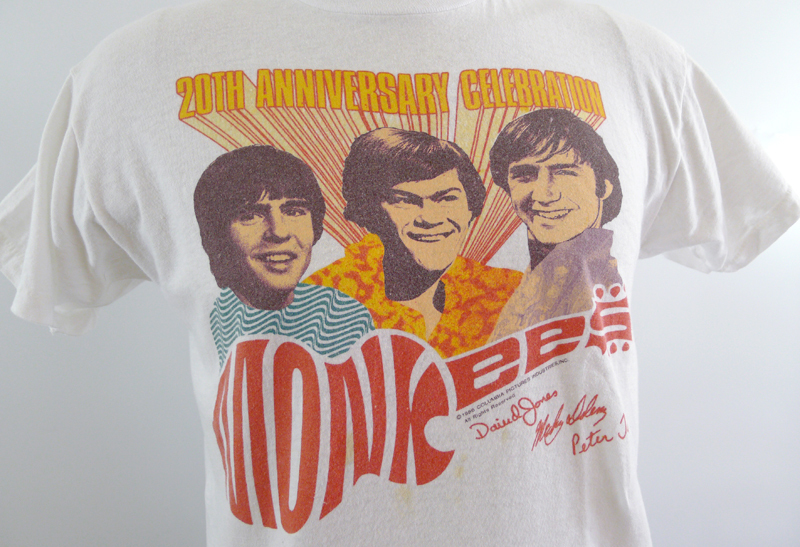 With Monkees fandom at its new height, two major Monkees conventions were scheduled around concerts in Philadelphia (August) and in Los Angeles (September), with various members of the trio making appearances at the events in both cities. 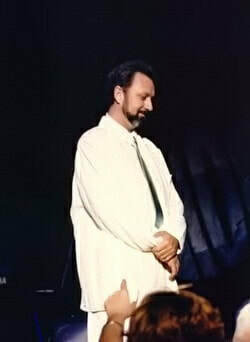 Though absent from most 20th Anniversary festivities, Michael Nesmith did attend a Monkees concert in disguise at Arlington Stadium in Texas on June 22. 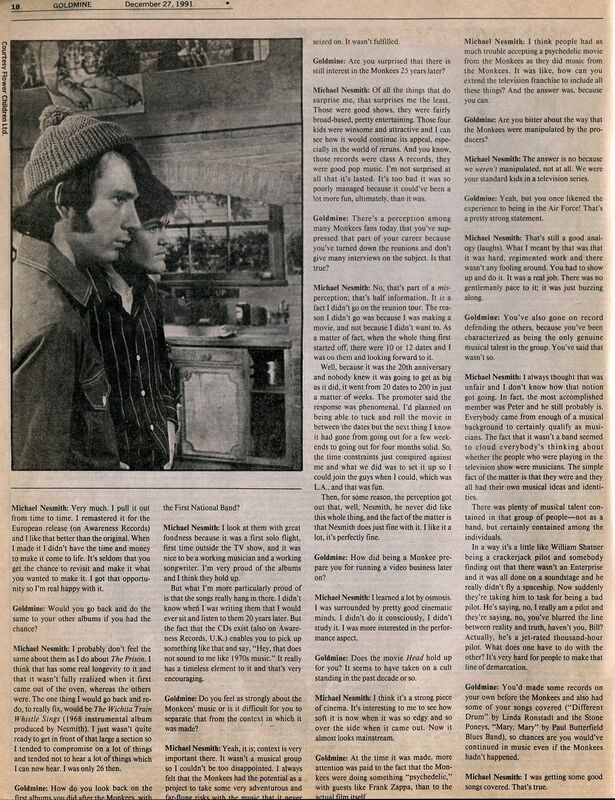 "I thought they did a great job," Nesmith told a Texas newspaper. "As a matter of fact, I called Micky the next day and told him I thought it was sensational. The whole thing had a real charm to it. 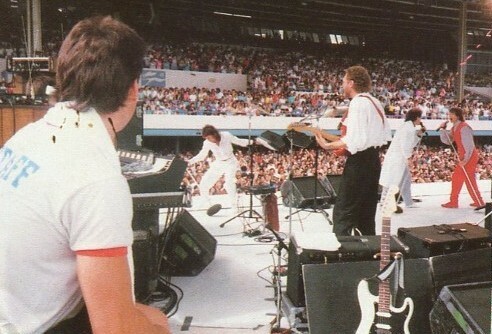 The crowd was ecstatic; they were happy and well-satisfied. I was proud of the guys." Michael finally joined Dolenz, Jones, and Tork onstage for the encore performance at the Greek Theatre in Los Angeles, California on September 7. 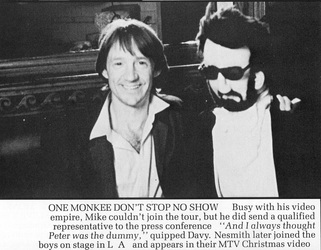 All four Monkees also took part in filming a Christmas medley music video for MTV in early December (seen below). 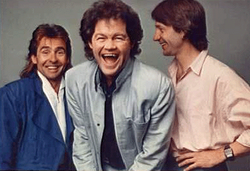 The video featured Mike as "Santa Claus" and was in heavy rotation on the cable network during the holiday season. After filming, the quartet hosted a party at a Manhattan nightclub to celebrate the end of a very successful year for The Monkees. 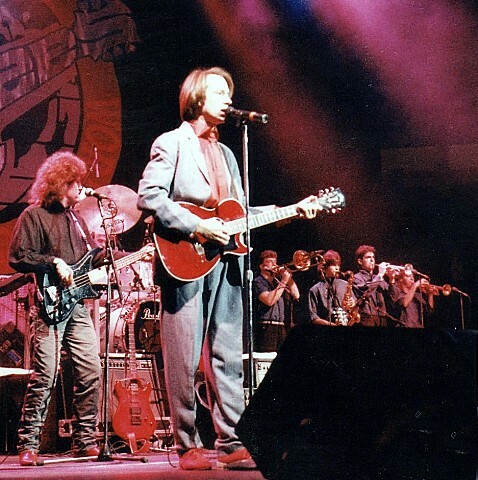 In 1995, Micky recalled the 20th Anniversary reunion tour in an interview with the Atlanta Journal/Constitution. "It was hard to do anything wrong," Dolenz said. 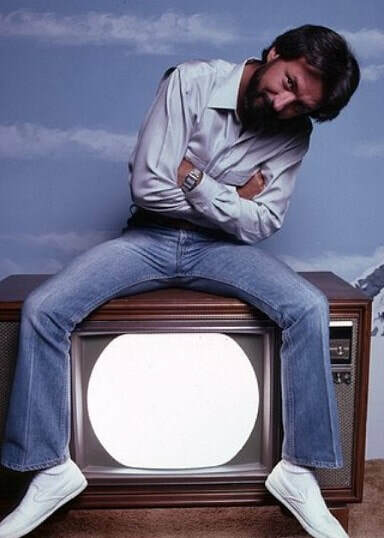 "There were three or four generations of folks out there. 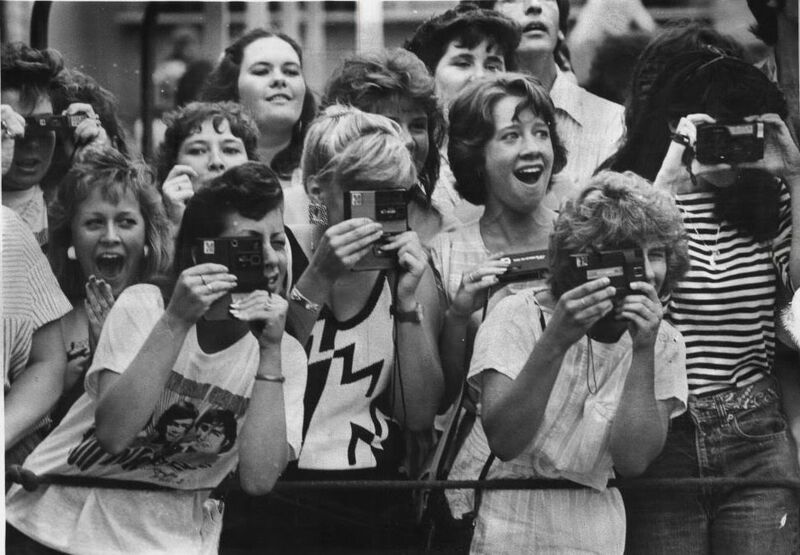 I was amused, but also touched - there was so much love." 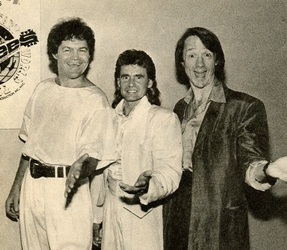 (Above) Music video "That Was Then, This Is Now"
​​​"I got some inkling of what the whole thing was about. I wondered to myself if I could have ever been a Monkees fan, because I really liked that experience; I liked the way Micky sang, I liked the way Davy sang and the way he looked. 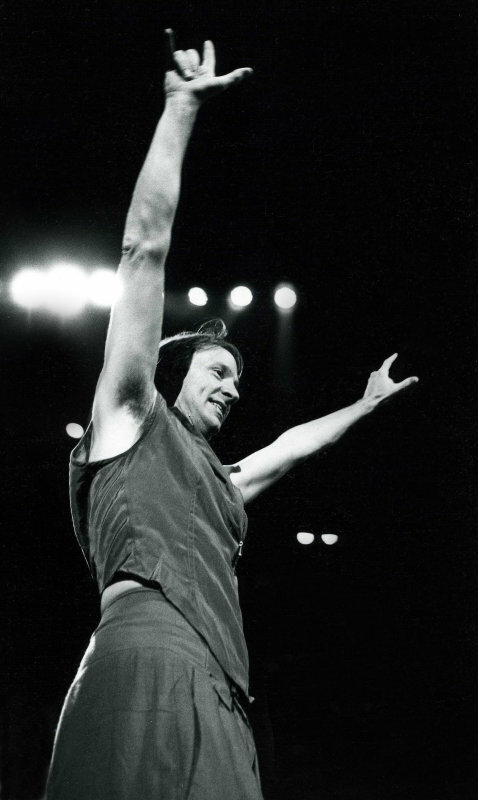 I liked the love that was exchanged between the audience and the performers, and the reciprocity of it, which was complete. 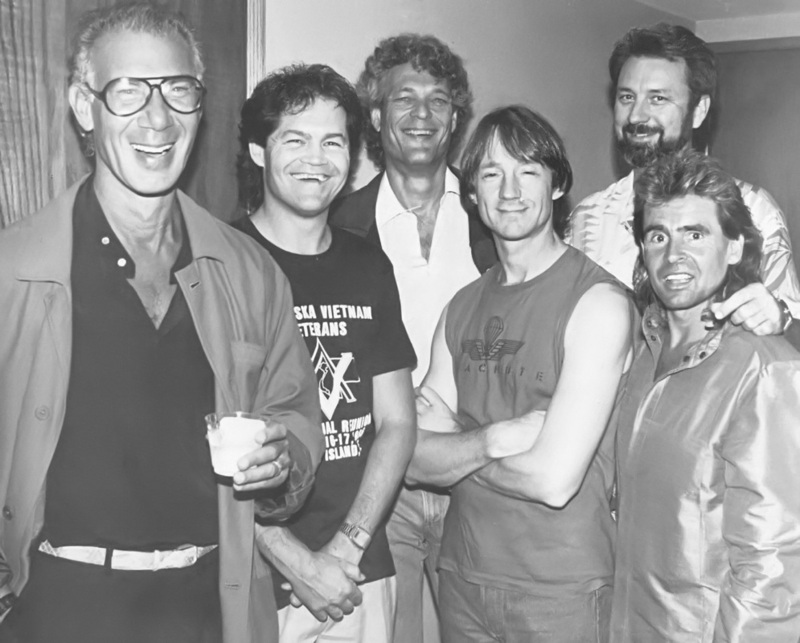 There was a lot coming off the stage from those guys, and a lot going back to the people. It was edifying on one hand, but on the other hand it was uplifting. 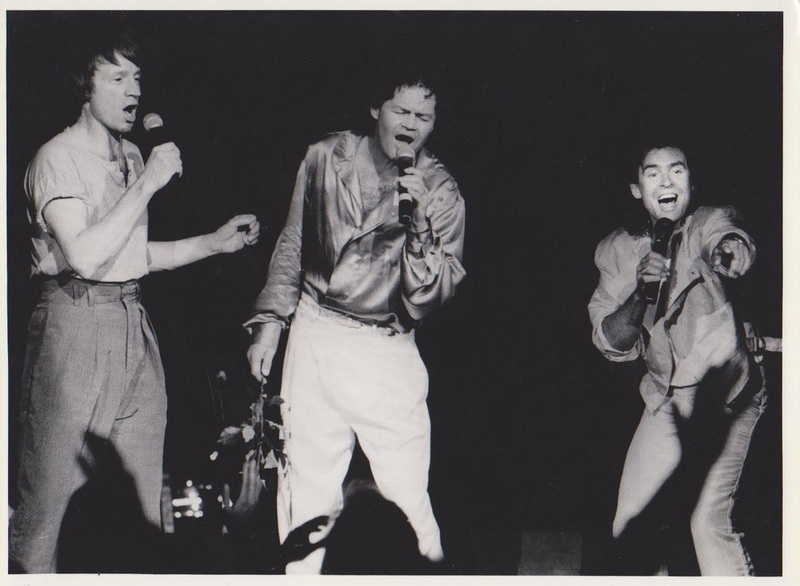 I had never realized that was going on at Monkees concerts because what I was trying to do was play loud enough so I could be heard." 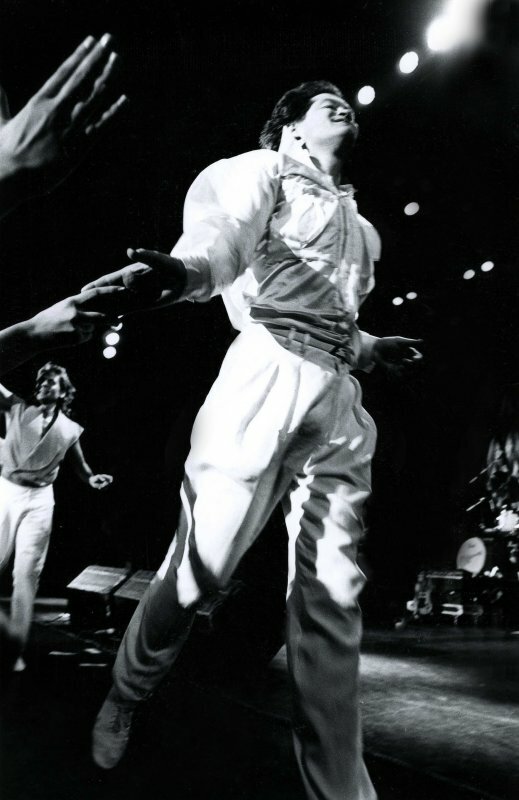 took their bows and waved goodbye to the audience.